Package of two commercial grade 203369 prefilters for F300, F50F, F58F. We measured the size at 12½ x 20 x 5/16. Two of these prefilters are used in the Honeywell 20 x 25 air cleaners. 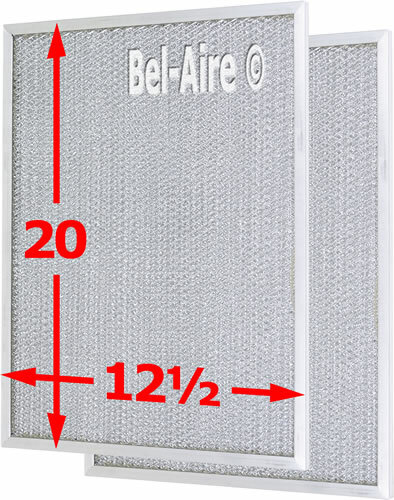 Only one prefilter is needed for the 20 x 12½ air cleaners. These prefilters are a genuine product of the Honeywell Commercial Air Products Division. Commercial products have higher standards for design, assembly, procurement, and production. Permatron polypropylene filters tests shows 43% increase in average arrestance efficiency over metal mesh prefilter. See Poly-203369 page. Fits the F300E1035, F300A2025, F50F1065, F58F1000 F300A2012, F300B2012, F50F1040 and F50F1057 air cleaner. This 203369 prefilter is for the F300E F300A F50F F58F and will NOT fit the the F50A or F50E Series. See below for more info. Genuine Honeywell residential grade prefilters are available for only $39 while supplies last. The residential grade prefilters should be handled with care, since they have a weaker frame that can be damaged. Additionally, the mesh can be pulled out of the aluminum frame that holds the mesh like a spring clamp. Our prefilter is a Honeywell commercial grade prefilter. The commercial prefilter has more layers of expanded aluminum, starting with a noticeably heavier gauge, course grid. The commercial prefilter weighs 33% more, you can not see clear through this prefilter like the residential version. 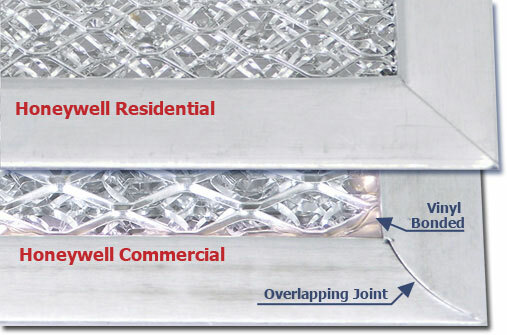 The commercial prefilter has an exclusive vinyl bonding process so the frame securely grips the mesh. Also the corners of the frame overlap adding more strength. The flimsy residential prefilter twists and flops when handled, the commercial version is ridged. We purchase these prefilters from the Honeywell Commercial Air Products division. These prefilters are made in Madison Wisconsin. Honeywell residential prefilters are stamped Product of Mexico. Choosing a prefilter depends on the model and size. 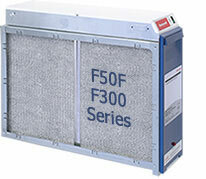 The F50F and F300 use the same prefilters and are available in 4 sizes. The F50A and F50E use a slightly shorter prefilter and are available in 3 sizes. To determine your model, the photos show the difference is in the power box. The newer F50F-F300 have a full length power box because the contacts for the cells are built in to the power box. The top-left photo shows the F50A and F50E. 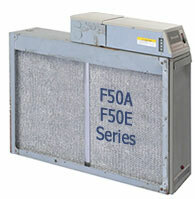 The F50A and F50E are identical except the F50E had been enhanced with an air flow sensor built in to the power box. The lower-left photo shows the F300 and F50F model. Note the F50F and F300 are identical except for paint color. The F300E was manufactured with a plastic access door from 2000 through 2005. This door and alll parts are interchangeable with all F50F and F300. The plastic door was the same as used in the F200E without RF (airwatch indicator). The F50A and F50E have a shorter prefilter height because the prefilter slot is a separate channel mounted inside the chassis with phillips screws. The chassis height is either 16" or 20" on all F50-F300 models, but the prefilter height is shorter on the F50A F50E models so to clear the screws. The F50A and F50E prefilters are either 15¾" or 19¾" high. The prefilter slot on the F50F and F300 is formed in to the chassis. There are no screws that the prefilter needs to clear. The cells are 16" or 20" high and the prefilters are also 16" or 20" high. To the left is a close up view of the F50a F50E prefilter channel. Bumps are formed in to the channel to help the prefilter ride over the screw heads.